Nevner svært mye spennende om stølhet (DOMS). Spesielt om hvor mye central sensitering har å si, og mye om hydrering (vann). Samt alt om betennelser og andre faktorer knyttet til DOMS. Sier bl.a. at glucogenlagre normaliseres etter 24 timer uavhengig av hva man spiser, men glykogen omsetningen i kroppen er begrenset i 2-3 dager etter. Nevner også at det er alle de perifere faktorene, sammen med de sentrale, som tilsammen skaper DOMS tilstanden. Prolonged intermittent-sprint exercise (i.e., team sports) induce disturbances in skeletal muscle structure and function that are associated with reduced contractile function, a cascade of inflammatory responses, perceptual soreness, and a delayed return to optimal physical performance. In this context, recovery from exercise-induced fatigue is traditionally treated from a peripheral viewpoint, with the regeneration of muscle physiology and other peripheral factors the target of recovery strategies. The direction of this research narrative on post-exercise recovery differs to the increasing emphasis on the complex interaction between both central and peripheral factors regulating exercise intensity during exercise performance. Given the role of the central nervous system (CNS) in motor-unit recruitment during exercise, it too may have an integral role in post-exercise recovery. Indeed, this hypothesis is indirectly supported by an apparent disconnect in time-course changes in physiological and biochemical markers resultant from exercise and the ensuing recovery of exercise performance. Equally, improvements in perceptual recovery, even withstanding the physiological state of recovery, may interact with both feed-forward/feed-back mechanisms to influence subsequent efforts. Considering the research interest afforded to recovery methodologies designed to hasten the return of homeostasis within the muscle, the limited focus on contributors to post-exercise recovery from CNS origins is somewhat surprising. Based on this context, the current review aims to outline the potential contributions of the brain to performance recovery after strenuous exercise. recovery strategies might be broadly differentiated as being either physiological (e.g., cryotherapy, hydrotherapy, massage, compression, sleep), pharmacological (e.g., non-steroidal anti-inflammatory medications) or nutritional (e.g., dietary supplements), all mean to limit continued post-exercise disturbances and inflammatory events within the exercised muscle cells. This peripheral focus emphasizes the importance of an accelerated return of structural integrity and functional capacity from below the neuromuscular junction. Conceptually, if the brain is held as central to the process of performance declines (i.e., fatigue), it stands to reason that it would also have some role in post-exercise recovery (De Pauw et al., 2013). Classically defined as an exercise-induced reduction in force generating capacity of the muscle, fatigue may be attributed to peripheral contractile failure, sub-optimal motor cortical output (supraspinal fatigue) and/or altered afferent inputs (spinal fatigue) innervating the active musculature (Gandevia, 2001). Alternatively, concepts of residual fatigue remain predominately within the domain of peripherally driven mechanisms, such as blood flow, muscle glycogen repletion and clearance of metabolic wastes (Bangsbo et al., 2006). The physical and biochemical changes observed during intermittent-sprint exercise have traditionally been interpreted in terms of metabolic capacity (Glaister, 2005). Indeed, lowered phosphocreatine concentrations (Dawson et al., 1997), reduced glycolytic regeneration of ATP (Gaitanos et al., 1993) and increasing H+ accumulation (Bishop et al., 2003) have all been associated with declining intermittent-sprint performance. While reductions in muscle excitability after intermittent-sprint exercise have also been observed (Bishop, 2012), metabolic perturbations are rapidly recovered within minutes (Glaister, 2005). The ultimate indicator of post-exercise recovery is the ability of the muscle to produce force i.e., performance outcomes. 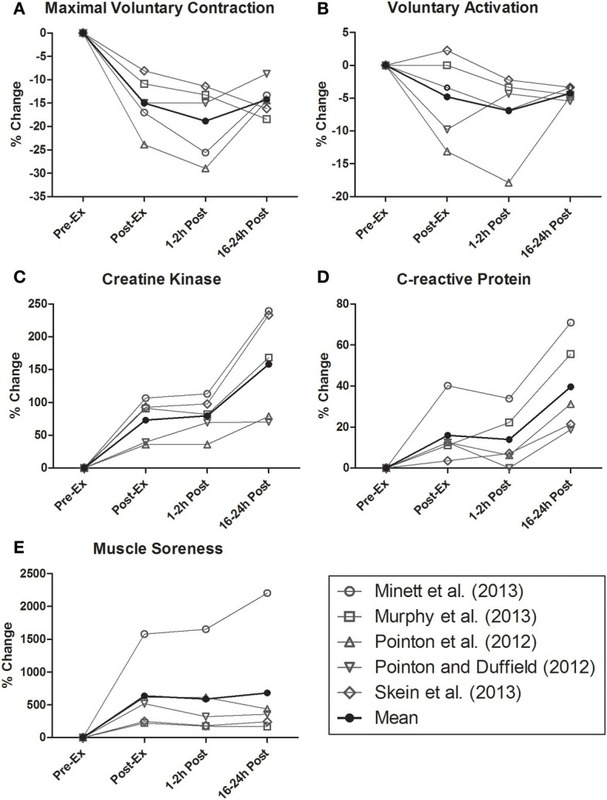 Reductions in skeletal muscle function after intermittent-sprint exercise are often proposed to be caused by a range of peripherally-induced factors, including: intra-muscular glycogen depletion; increased muscle and blood metabolites concentrations; altered Ca++ or Na+-K+ pump function; increased skeletal muscle damage; excessive increases in endogenous muscle and core temperatures; and the reduction in circulatory function via reduced blood volume and hypohydration (Duffield and Coutts, 2011; Bishop, 2012; Nédélec et al., 2012). Conversely, Krustrup et al. (2006) reported declines in intramuscular glycogen of 42 ± 6% in soccer players, with depleted or almost depleted glycogen stores in ~55% of type I fibers and ~25–45% of type II fibers reasoned to explain acute declines in sprint speed post-match. Importantly, muscle glycogen resynthesis after team sport activity is slow and may remain attenuated for 2–3 days (Nédélec et al., 2012). Such findings highlight the importance of nutrition in post-exercise recovery (Burke et al., 2006); yet it is noteworthy that muscle glycogen stores remain impaired 24 h after a soccer match, irrespective of carbohydrate intake and should be recognized as a factor in sustained post-match suppression of force (Bangsbo et al., 2006; Krustrup et al., 2011). Mechanical disruptions to the muscle fiber are task dependant, though likely relate to the volume of acceleration, deceleration, directional change and inter-player contact completed (i.e., tackling or collisions) (McLellan et al., 2011; Duffield et al., 2012). Importantly, EIMD manifests in reduced voluntary force production that has been associated with the elevated expression of intracellular proteins (e.g., creatine kinase and C-reactive protein), swelling, restricted range of motion and muscle soreness (Cheung et al., 2003). Whilst it is generally accepted that lowering blood-based muscle damage profiles may hasten athletic recovery, mechanisms explaining the return of skeletal muscle function are somewhat ambiguous (Howatson and Van Someren, 2008). Interestingly, markers of EIMD are also not closely associated with muscle soreness (Nosaka et al., 2002; Prasartwuth et al., 2005), though perceptual recovery is reportedly related with the recovery of maximal sprint speed (Cook and Beaven, 2013). While this raises questions in terms of the physiological underpinnings of muscle soreness, weaker relationships between EIMD and neuromuscular performance may suggest the potential for other drivers of recovery outside of peripheral (muscle damage or metabolic) factors alone. Finally, while the relationship between hydration status and intermittent-sprint performance remains contentious (Edwards and Noakes, 2009), fluid deficits of 2–4% are common following team-sport exercise (Duffield and Coutts, 2011). Mild hypohydration reportedly demonstrates limited effects on anaerobic power and vertical jump performance (Hoffman et al., 1995; Cheuvront et al., 2006); however, some caution is required in interpreting these data as these testing protocols reflect only select components of team sport performance. Nevertheless, the role of hydration in recovery should not be overlooked as changes in extracellular osmolarity are suggested to influence glucose and leucine kinetics (Keller et al., 2003). Further, the negative psychological associations (conscious or otherwise) derived from a greater perceptual effort incurred in a hypohydrated state may impact mental fatigue (Devlin et al., 2001; Mohr et al., 2010). Rather, that the integrative regulation of whole body disturbances based on these peripheral factors, alongside central regulation may be relevant. Dette innlegget ble publisert i Forskning og artikler og merket med Betennelser, bevegelse, Blodsirkulasjon, Ernæring, hjernen, hjertet, melkesyre, Nervesystemet, oksidativt stress, pH, trening. Bokmerk permalenken.